Every so often I get hungry for a burger. I’m not talking every day. C’mon, maybe four or five times a week I’ll think, yeah, a burger would taste good. It’s not like I have a problem or anything. Most of the time I don’t act on these urges; I push them down into that dark, dirty place with other urges like ones to punch the loud talker on the bus or to watch ten straight hours of the NBA Playoffs. 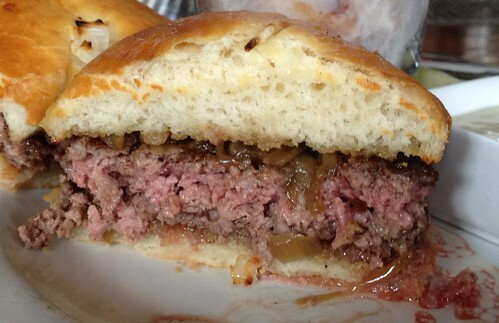 I cracked on Sunday and went to Owen & Engine for the first time with burger meat on my mind. I showed up at around 1pm and the place was pretty full. There are maybe ten seats at the bar and I was able to get two for a friend and myself (friend and I, friend and me, what’s correct?). The place is smaller than I thought, unless they have an upstairs or something. A steady crowd of neighborhood types and movie-goers kept the staff hopping (it’s right across the street from the Regal City North 14). Okay man, I thought, I would have been okay with, “It’s good.” I certainly appreciate the passion though. So there it is up top – burger, medium, no cheese, $14. The grilled onions came with it, I didn’t ask for them but they were a nice touch. No lettuce or tomato, but you get a pickle spear. It comes on a potato bap, which is Scottish for bun. 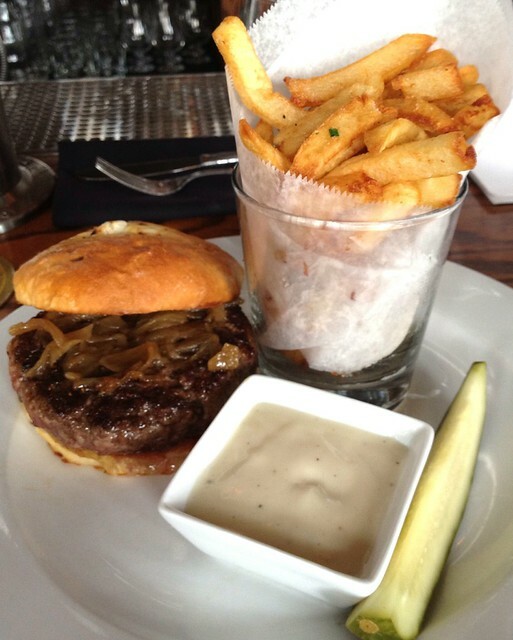 The chips (yes, fries) are nice and come with a distinctive malt vinegar garlic aioli, which was darn good, but we aren’t going to go into that. Okay, got it now. I call that fried. This distinction between grilled and fried isn’t something that makes sense to everyone, so I’m not faulting this bartender. Be sure, this would have been a different experience had it been set on a grill where the juices dripped into a flame and were reconstituted into the meat via flame vapor/smoke/stuff. I don’t prefer one over the other, heck, I don’t even consider grilled burgers and fried burgers in the same food group. It’s kind of like pizza; thin crust, stuffed, and regular pizza are three distinct groups worthy of singular consideration. I got a little off topic there, sorry. You need to know that I loved this burger, this place, the sides, and the atmosphere. It’s really enjoyable. I can tell because when I left I was pumped up. I was sending pictures to G and telling her all about the malt vinegar aioli and the brisket/short rib combo. Oh yeah, I didn’t even mention the great IPA from Dark Horse Brewing. I can’t blow any holes in this place at all. I can see taking people I care about here. Posted in food on 2012/04/30 by John.